The sermon archive is complete with the ability for visitors to search for audio, video and text sermons by category, tag, date and speaker. Risen has powerful customization options that make it easy to change the theme’s colors, fonts and background. The sermon archive can be fully renamed using the theme options, making this a WordPress theme not only for churches but also parachurch ministries, nonprofits and charities, conference websites and multimedia presentation archives. This theme is well-documented with over 30 pages of organized, easy to follow instructions explaining how to use its features. Additionally, a series of video guides is included and support is provided. The Risen church theme was designed to be responsive. In other words, it is mobile-friendly and will adapt itself to fit comfortably on devices with small screens such as phones and tablets. Scan the QR code below with your mobile device for a live demonstration. Share your church photos and videos using the theme’s gallery features. Create multiple “albums” by organizing your photos and videos into categories. Sermon Archive with embedded video (YouTube or Vimeo), Audio Player, MP3 download, online sermon reading, PDF download and archives by date, category, speaker and tag. Gallery with photos, videos, categories and Responsive Lightbox. Search Results for posts, pages, sermons, photos, videos, events, locations and staff. Contact Form with multiple recipients and reCAPTCHA support. Custom Page Templates for sermons/multimedia, events (upcoming, past), gallery (categories, all items, images only, videos only), locations, staff, blog and contact. 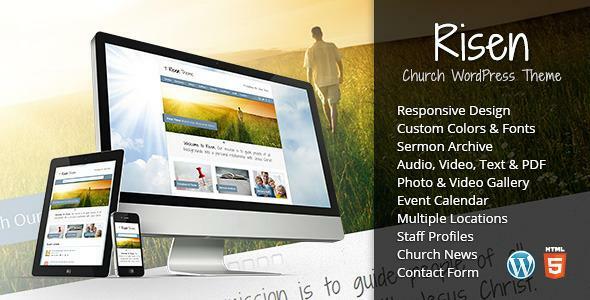 Share the post "Risen – Church WordPress Theme"